CARA stands for Cometary ARchive for Afrho (previously named Cometary Archive Amateur Astronomers). Good news is going to come. We have hardly worked, and are still working, on building the NEW Af[rho] measures's Database. A new Winafrho software version will be soon available with included a function to upload automatically afrho datas to the database on the fly. As well as updating Winafrho, we are going to adapt the website procedures to match the new database format. Stay tuned for big news !!! What is happening to C/2017 O1 (ASASSN)? Comet C/2017 O1 (ASASSN) was discovered on July 19 displaying already a large diffuse gas coma in the following days. 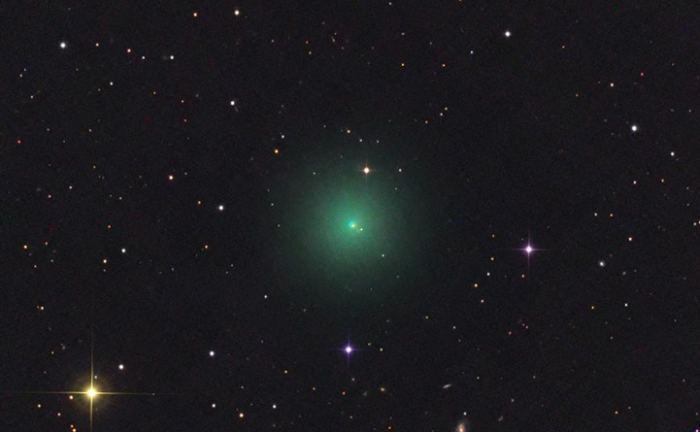 This color image was taken by Rolando Ligustri on July 27, the green color of the coma is due to the presence of strong C2 emission bands in the spectrum. The page Reference has been updated with two published new articles. On September 9th and 10th the annual meeting of Project CARA and Comet Section of Italian Amateur Union will be held at Sala Civica "Pegoraro Fortunato" located in Due Carrare (PD) Italy, via Galileo Galilei, 1 - Mezzavia. This year a special guest will be present: Erik Bryssinck, from Belgium., a good friend and collegue of the CARA Project since the beginning. We putted the Afrho measures DataBase off-line for maintenance reasons. It will be on line as soon as possible. We apologize for he inconvenience. As probably already noticed we have modified our logo to be "coherent" with the new designations ot the acronym CARA. Thanks to Mauro Facchini, from Osservatorio Astronomico "G.Montanari" for design the new logo. A release of the CARA database is on line containing comet's data. The numbers of measures and comet are upgraded continuosly due the CARA's users contributions. Notice that available datas are provided "as is", by the observers or teams that made the measurements. It is with much sadness that I share with you the loss of our friend Giovanni Sostero. DISCLAIMER: All datas you will find in this site, are all copyrighted material and are subject to the following restrictions on their use. Take a look of our Policy and Disclaimer page for details.